With more than 300 exhibitors, Your Horse Live is the shopping event of the year! The two days combine incredible shopping with fantastic demonstrations from top celebrities, for a fun-filled weekend. Check out the Your Horse Live team’s tips for advice on how to make the most of the greatest equine event in the calendar! The show is held on November 9 and 10 at Stoneleigh Park, Warwickshire. 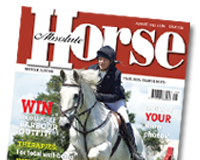 Book your tickets in advance to guarantee your place and receive great savings – visit www.yourhorselive.co.uk for all the latest information, news and ticket offers.